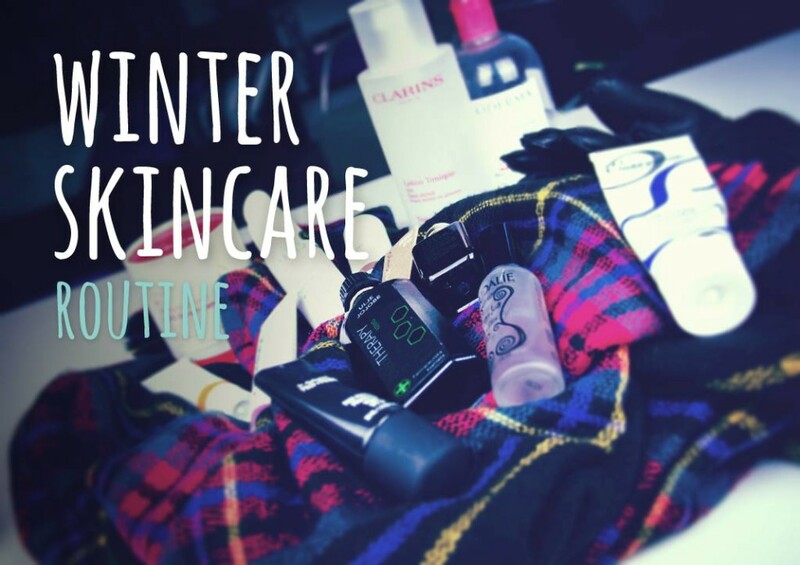 Autumn is usually when I start transitioning into my winter routine, I tend to use up summer products and replace them with new winter favorites. Some products however never change so you will see some much loved and trusted products here. 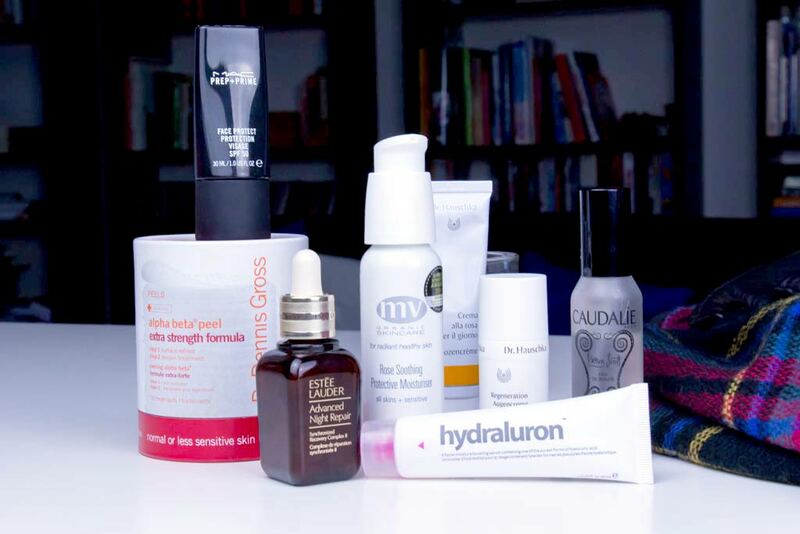 At the cost of sounding repetitive, skincare is what it is all about for me. Yes I am a makeup addict, but if the base, your skin, is not well taken care of and if you aren’t comfortable in your own skin (no pun intended) then make up can only make things worse. If there is ever something I splurge on it is on the skincare products. 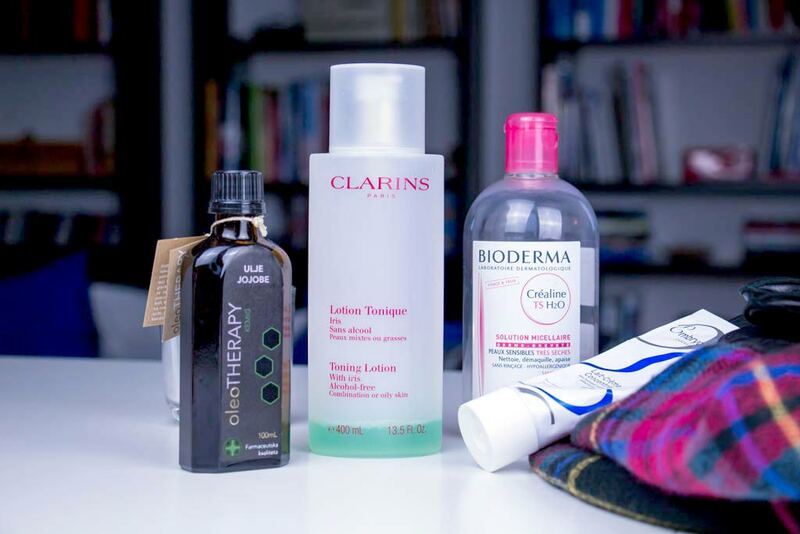 This may seem like a lot of stuff, but each product I use is here for a reason and the basic principle of my skincare doesn’t change, cleanse, tone, serum, moisturize. As toner, a couple of spritzes. How did I never mention this on my blog?! (or did I). I love, love this! It wakes up my skin in the morning, I use it to refresh my skin during the day all year, I always have a bottle with me in my purse. As a daily part of my skincare routine I spray it on in the morning after I have washed my face (with lukewarm water) and pat it into my skin. 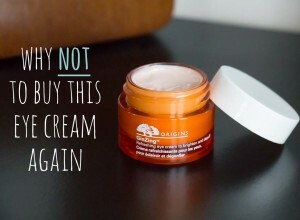 I know, I have mentioned this five times before, but hey it works fabulously for my skin and I don’t see it leaving my routine any time soon. I have been liking but not really loving this, maybe because I expected magic, which is a bit silly, so it isn’t fair that I don’t love it. It is very light weight and not at all oily, I do really like the texture. Its one of those serums that you don’t even have to wait for it to sink in. Even though you are supposed to get another version of the same serum for around the eyes, I just use this allover the face. It gives the skin a bit of help regenerating and I do find my skin has been happier in the morning since I’ve started using this. I wrote about this in my November favorites so I won’t write about it more. It is embarrassingly expensive but sooooo good! I am not sure if I will be repurchasing it though so I will revert back to my ultimate winter moisturizer, the Dr. Hauschka Rose cream (I combine the original with the light which I use on my t-zone). The moisturiser has no SPF so depending on the foundation I am using I will apply a thin layer of MAC Prep and Prime Face Protect SPF 50 (although we have seen no sun in the last two weeks). Ok, so this is an eye-cream for mature skin but I have been struggling so much with finding something that is nourishing enough yet light at the same time that I decided to give it a try. I am loving it so far. It is meant to “diminish lines” but I have not seen any diminishing, however I love how hydrated my eye area is. 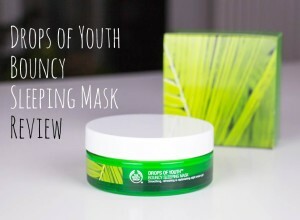 Not sure I would recommend it for super young skin because it may be too rich, but it works for me. On alternate nights I use an AHA treatment. These past couple of months I have replaced my usual Alpha-H Liquid Gold for Dr. Dennis Gross Alpha Beta Peel Extra Strength Formula but to be perfectly honest not sure that I am seeing any difference so I will definitely go back to Liquid Gold. God my skin is so not behaving, it’s hard to pinpoint what it wants! I also usually like the Caudalie Elixir and Hydraluron. 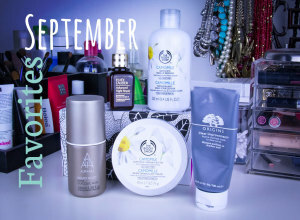 I think that this year is the first year that I have made the transition from summer to autumn skincare early enough, but at the same time I didn’t change too many products. That plus the MV Organics moisturiser is sooooooo good even though it is a sin how expensive it is! I am super happy with my skin at this point and if I could just find an eye-cream that I love I would have to say my skincare is exactly where I want it! 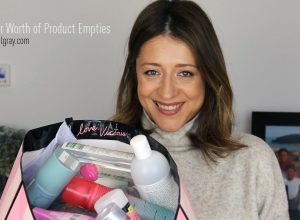 I hope you find your best skincare recipe soon!